A glider is a special kind of aircraft that has no engine. There are many different types of glider aircraft. Paper airplanes are the simplest gliders to build and fly. Balsa wood or styrofoam toy gliders are an inexpensive vehicle for students to have fun while learning the basics of aerodynamics. Hang-gliders are piloted aircraft having cloth wings and minimal structure. Some hang-gliders look like piloted kites, while others resemble maneuverable parachutes. Large piloted gliders have standard aircraft parts, construction, and flight control systems, but no engine. The Space Shuttle returns to earth as a glider; the rocket engines are used only during liftoff. Even the Wright Brothers gained piloting experience through a series of glider flights from 1900 to 1903. 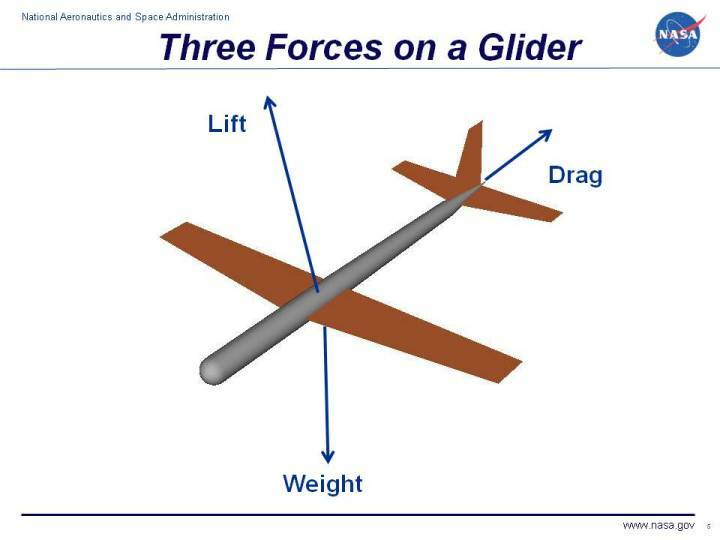 In flight, any glider has three forces acting on it as compared to the four forces that act on a powered aircraft. Both types of aircraft are subjected to the forces of lift, drag, and weight. The powered aircraft has an engine that generates thrust, while the glider has no engine and, therefore, no thrust. Forces are vector quantities having both a magnitude and a direction. The weight acts through the center of gravity and is always directed towards the center of the earth. The magnitude of the weight is given by the weight equation and depends on the mass of the vehicle plus its payload. The lift and drag are aerodynamic forces and act through the center of pressure. The drag is directed opposite to the flight direction, and the lift is directed perpendicular to the flight direction. There are many factors that influence the magnitude of the lift and drag forces. In order for a glider to fly, it must generate lift to oppose its weight. To generate lift, a glider must move through the air. The motion of a glider through the air also generates drag. In a powered aircraft, the thrust from the engine opposes drag, but a glider has no engine to generate thrust. With the drag unopposed, a glider quickly slows down until it can no longer generate enough lift to oppose the weight, and it then falls to earth.